Hi everyone and welcome back! It’s challenge day over at Kraftin Kimmie Stamps. Today’s challenge is to use your distress inks. I love love love my distress inks. They can add so much to a project! So get your fingers inky and come play with us! You can read more about the challenge over on Kraftin Kimmie Blog. For my card today, instead of coloring my mini monsters, I used to my distress inks. 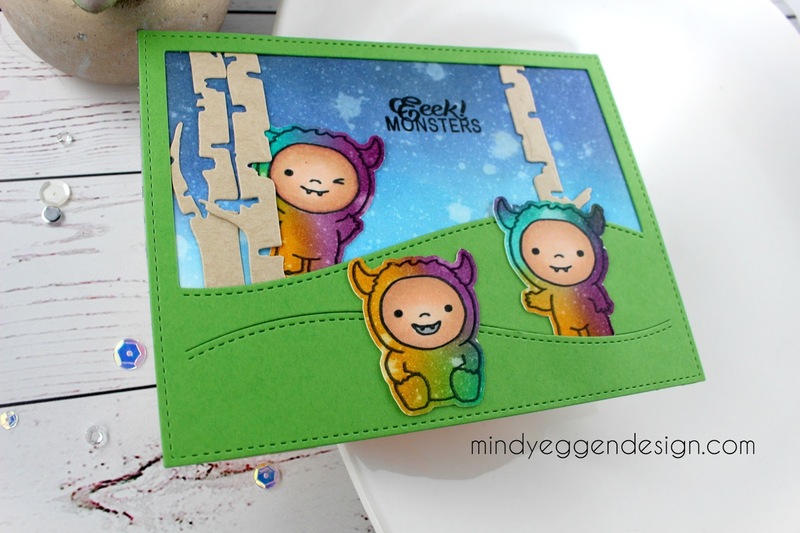 I stamped them out onto Neenah white cardstock and created a mask for their face. Then I blended Peacock Feathers, Seedless Preserve and Spiced Marmalade over the top of them. I remove the masks and colored in their faces with copic markers. Pretty cool huh? I cut them out with my scan n cut machine or you can fussy cut them. For the background, I used some Salty Ocean, Blueprint Sketch and a little black soot to create an evening sky. This is a cute fun card ! You did a great job on coloring their costumes.